The terminal blocks come in 2 and 3-pin pieces . Slide them together. Make sure that you line up pin 1 of the backpack with pin 1 of the display. Pin 1 is on the right side of the backpack closest to the Adafruit logo. Pin one of the display should be marked. When correctly installed, the blue terminal block will be close to the edge of the display. Solder the header to the backpack. 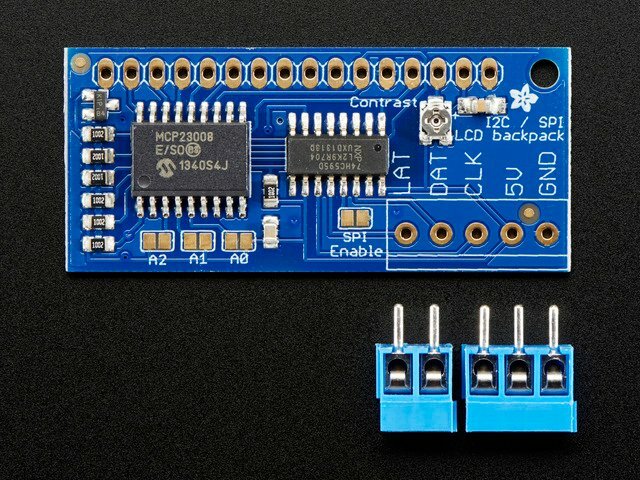 Make sure that as you solder the first pin, the backpack PCB isn't leaning against the LCD, where the terminal blocks could short against some components. You can put some electrical tape or foam tape behind to avoid this if you think it could be an issue. My LCD only has 14 pins. Which holes do I use? The extra two pins are for the backlight. 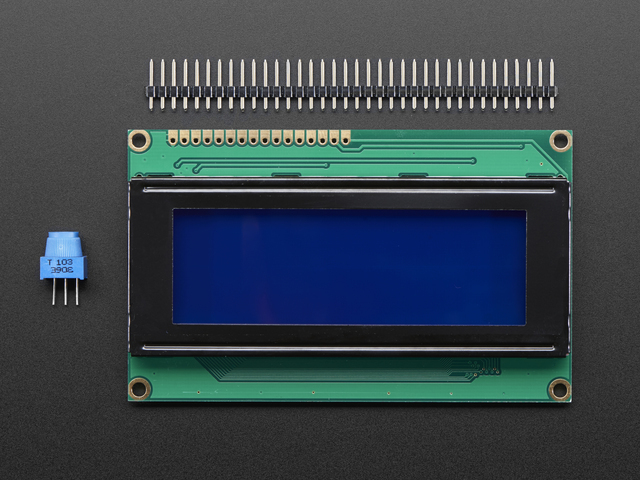 Your LCD doesn't have a backlight. Here's a picture of the backpack board layout, with pins 15 and 16 located. Just leave those empty. Cut the pin header down to 14 pins instead of 16, and attach your LCD to holes 1-14 in the backpack. This guide was first published on Aug 27, 2012. It was last updated on Aug 27, 2012. This page (Assembly) was last updated on Apr 19, 2019.